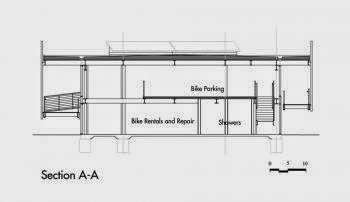 Bikestation Fernando Vazquez Studio Archi-new - Free Dwg file Blocks Cad autocad architecture. Archi-new 3D Dwg - Free Dwg file Blocks Cad autocad architecture. ed in the United States, an area that is larger than Delaware and Rhode Island combined. These statistics underline the need for alternatives, either on foot, by public transport or bicycle. This is a process which is particularly suitable for hot climates such as Southern California, a region normally associated with the automobile. Bikestations in Long Beach, south of Los Angeles, is a small but important ingredient of an evolution towards more cycling. Architect Fernando Vazquez answered some questions about the project. What were the circumstances of receipt of the committee for this project? 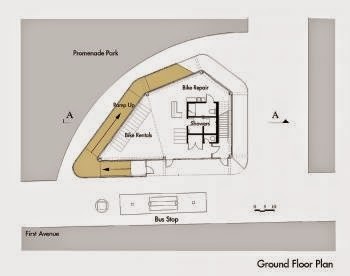 Fernando Vazquez studio had done experimental temporary bicycle parking in 1995 to help the population of Long Beach near Metro Blue Line and cycling fans. The success of the program and the temporary building, which has received several design awards and different environmental organizations, led to the city of Long Beach ordered a permanent job in the same company design. Fernando Vazquez studio approached the design of the building as a positive sign of propaganda, pointing to the benefits of cycling and public transport for a sustainable environment. 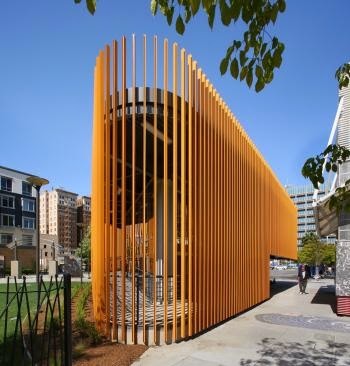 Located on the Paseo Nuevo Centro Park, the building is part of the new "Transport first street gallery", a link to the blue metro line and the extensive regional bus network. 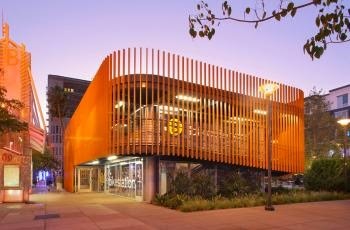 The building known as the cycling of commercial space, bike rental space, repair areas, showers and a membership for only parking 24 hours guaranteed programs. 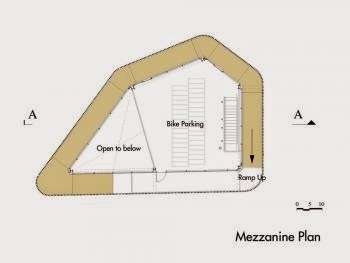 The parking area is located on a mezzanine overlooking the commercial space below. Cyclists reach the mezzanine obtained a continuous ramp that wraps around the glass installation. The ramp is guaranteed by standard aluminum profiles fixed vertically 9 inches. Aluminum fins, roof cantilevered on the ramp and the ramp shadow of the outer wall of the facility so it is very comfortable on hot days. The space is naturally ventilated by sliding doors well placed glass. The ramp space will also be used for exhibitions and presentations of alternative energy solutions and transportation. How the finite to the project as designed building work? Does dramatic changes between and / or lessons learned during construction? They were no changes in the design originally developed. How does the building compared to other projects in the office, either the same or other buildings? Fernando Vazquez Studio is a champion of progressive causes. Our clients include several non-profit organizations whose philosophy we strongly support. Include Bikable Communities, developer of Bikestations and innovative transport systems, the family planning program, dedicated to providing reproductive health services and works on the construction of affordable housing and urban agriculture. Photovoltaic study models for these groups are representative of the mission and goals of the entities. How does the building relate to contemporary architectural trends, whether sustainability, technology, etc.? The building itself is dedicated to the concepts of health, green living, emphasizing cycling and public transport. The openness and lightness of the structure served as a metaphor for these values. Interview by e-mail John Hill.